Hunter’s Home is the only remaining pre–Civil War plantation home in Oklahoma. A kitchen garden, field crops, orchards, animals, and a mercantile store give visitors a window into life on a antebellum Cherokee plantation. Visitors can experience living history season from Labor Day through Memorial Day, featuring living history interpreters demonstrating nineteenth-century trades, chores, cooking, gardening, and crafts. Living history activities are 10 a.m. to 4 p.m.
George Michael Murrell was born to a prominent family in Lynchburg, Virginia, in 1808. He moved to the Athens, Tennessee, area as a young man to pursue mercantile interests with his brother, Onslow Glenmore Murrell, and future father-in-law, Lewis Ross. There, in 1834, George Murrell met and married Minerva Ross. Minerva was the oldest daughter of Lewis and Fannie (Holt) Ross, members of a wealthy and influential Cherokee family. Lewis was a merchant, planter, and national treasurer of the Cherokee Nation. His brother, John, was principal chief of the Cherokee Nation from 1828 until his death in 1866. When the Cherokees were forced to leave their homes during the Trail of Tears 1838–39, Murrell chose to move with his wife’s family to the new Nation in the West. In Park Hill, Indian Territory, he established a plantation and built a large frame home similar to those he remembered in Virginia. He called the Greek Revival-style house Hunter’s Home because of his fondness for the fox hunt. A rock building was added beside the creek branch over a cold spring to preserve food. Outbuildings included a barn with stables for his horses. Other buildings probably added were a smokehouse, grist mill, blacksmith shop, corn cribs, and small cabins for slaves and employees. Murrell and his father-in-law also established a mercantile business in Park Hill, later moving it into Tahlequah, the capital of the Cherokee Nation. The home is a National Historic Landmark, listed on the National Register of Historic Places, and part of the Trail of Tears National Historic Trail. A teacher’s curriculum and activity guide is available. The guide is designed to accompany the living history programs at Hunter’s Home. Click to download the guide (PDF). Keep up to date with events and activities at Hunter’s Home! Join our email list. The first issue of Crossroads celebrates the agricultural heritage of Oklahoma and the Cherokee Nation with a visit to the Murrell Home. Find out more. A publication exploring this historic site is available. 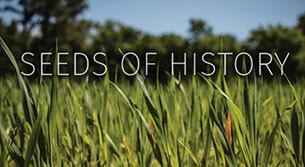 The thirty-page book features a history of the Cherokee plantation and dozens of full-color photos. 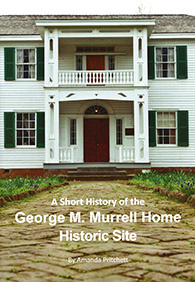 Written by Amanda Pritchett, the book is the first comprehensive history published about the historic site. The book chronicles the construction of their home in Park Hill following Cherokee removal through the suffering of the Civil War, and beyond. The book is available in the online store and in the museum's gift shop.